When it comes to installing fencing on your ranch, careful planning can make all the difference. Fencing is a very permanent and visual aspect of your property, and it’s one that you and your visitors will see on a daily basis. You’ll want to make sure that you make the right choice in your fencing and its layout that you won’t regret. Every property is different, so in planning out your fencing you need to establish what specific needs your property has. Are you looking for fencing to safely contain horses in pastures? How much does its appearance matter – does your farm have an established style that you are looking to match? Are you looking for particular features in the fencing or layout that you choose? You will want to present a perimeter that both establishes privacy and keeps your property safe. 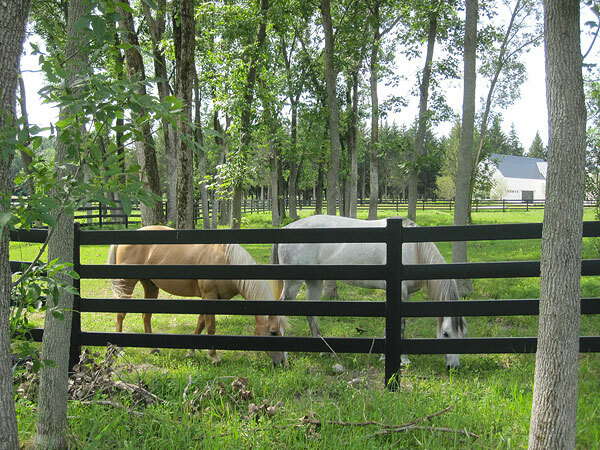 With Buckley Steel Board Fence, your fencing choice can provide both safety for your horses and a stylish, classic appearance. Buckley Steel Board Fence is perfect to line the outer perimeter of your property, since it provides a solid but attractive barrier. It’s also highly functional and will withstand climbing and impact. Consider running a single perimeter fence that encloses your entire property. This perimeter fence becomes a landscaping benefit that is visually appealing, and is also serves as a barrier to keep a horse on your property if one gets loose. You might consider installing automatic entrance gates on access roads for added convenience. When designing the layout of the inner rings and pastures, keep accessibility in mind. You will want to make sure that all areas on your property are accessible by road, and that they will also be safe to navigate in all types of weather. Keep the distance between the fence lines of adjoining pastures at least eight feet wide to keep handlers and horses safe when walking between them. The location of gates will also be very important to the functionality of your property. Buckley Steel Board Gates are available in four-foot, eight-foot, and twelve-foot lengths, allowing you to select the gate size most appropriate for its use. You will want to position gates so that there is plenty of room around them to bring horses and vehicles in and out. Avoid locating pasture gates in the corners of pastures, since doing so will encourage horses to crowd the area which could result in injury. With careful planning, you can design your fencing so that it specifically suits your property. If you would like more information on fencing basics, see our blog post.